Our friends Rob and Lauren at Photography Concentrate have just launched a great new set of videos to help you find your way through Lightroom. The concept for this tutorial is really simple, there are 11 videos and in each video Rob walks through editing one photo from start to finish. You should check out the before and after photos on the landing page! This is a tutorial that has been requested by Photography Concentrate readers numerous times, so click on the banner and see what you think about it. Right now the tutorial is on sale at a special Launch price of US$13.26 (30% off the regular price of US$18.95). The Launch sale will be ending on Tuesday April 1st at 11:59PM Pacific Time so pop over now and have look at those images and check out the FREE SAMPLE VIDEO. 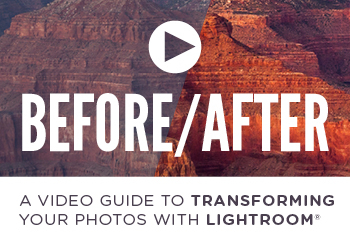 If you don't have Lightroom yet, you can order it from Amazon. Price: £78.99 & FREE Delivery in the UK.